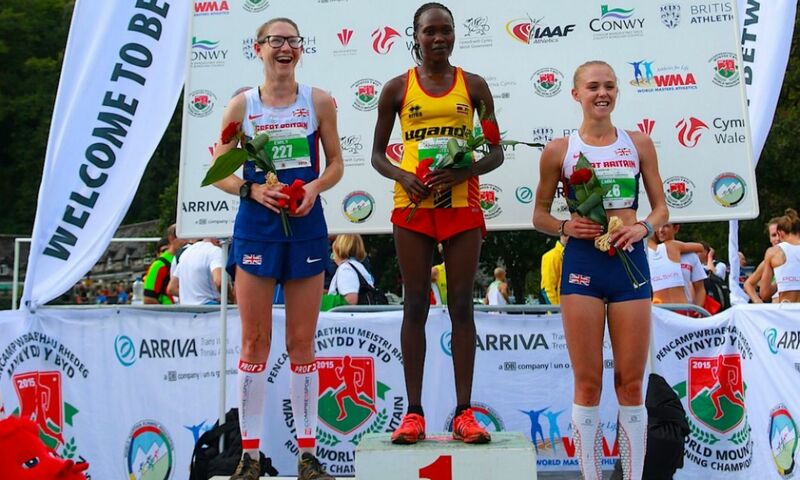 Ugandan athletes won the men’s and women’s titles at the World Mountain Running Championships in North Wales, but Britain won women’s team gold on a day when every member of Team GB went home with a medal, reports Gareth Bicknell. Fred Musobo won the senior men’s race in Betws y Coed, triumphing in 49:00 over the 13km course with 750 metres of ascent. His compatriot Stella Chesang won the senior women’s race, which was 8.9km with 500m ascent, in 37:52. Home advantage certainly worked for the British athletes, with Emily Collinge second in the women’s race in 38:23 to lead the British women to team gold. Her team-mate Emma Clayton was third in 38:33, with Sarah Tunstall fourth in 39:06 and Vic Wilkinson 15th in 40:34, meaning the host nation were unstoppable ahead of runners-up USA and third-placed Uganda. The success didn’t end there for GB, with Robbie Simpson (50:31) earning bronze in the senior men’s race behind second-placed Bernard Dematteis (49:44) of Italy. Britain won medals in every event in the team competitions, with the junior women claiming silver, and the senior men and junior men both taking bronze. Simpson said he had been confident of his medal chances going into the race despite being up against four Ugandan athletes and the might of Italy and the USA. Allie Ostrander of USA won the first world championship race of the day, the junior women’s. The race was one lap of the course, totalling 4.7km with 250m ascent, starting from the village green in Betws y Coed and heading up into forested hills to the Llyn Elsi resevoir, before a fast descent back down. Ostrander won in 19:44, ahead of silver medallist Michaela Stranska (Czech Republic, 20:23) and third-placed Elsa Racasan (France, 20:31). Welsh athlete Heidi Davies was fifth in 20:55. The junior men’s race was two laps of the course, as was the senior women’s. Turkey’s Ferhat Bozkurt won the 8.9km (500m ascent) junior men’s race in 33:56, with his compatriot Mustafa Goksel claiming bronze in 35:53 and USA’s Levi Thomet separating them in 35:50 for second place. Max Nicholls was the highest British finisher in in the junior men’s, in sixth place (36:23). Italy won the senior men’s team competition, ahead of Uganda and Great Britain. Turkey won the junior men’s with USA second and GB third, while Czech Republic claimed the junior women’s team title.